Surgical orthodontics is also known as orthognathic surgery because, just as an orthodontist repositions teeth, an oral and maxillofacial surgeon uses orthognathic surgery to reposition one or both jaws. Just as “orthodontics” means “straight teeth”, “orthognathic” means “straight jaws”. In fact, because moving the jaws also moves the teeth, orthognathic surgery is usually performed in conjunction with orthodontics so that the teeth are in proper position after surgery. 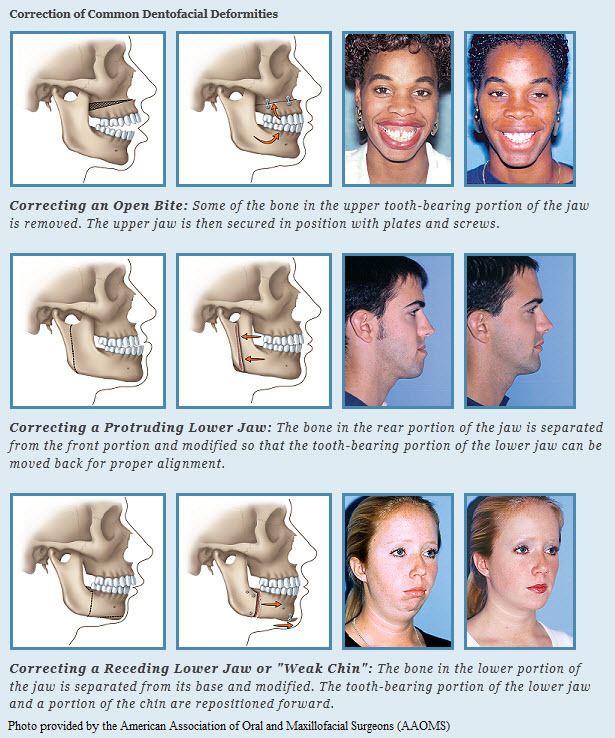 The objective of orthognathic surgery is the correction of a wide range of minor and major facial and jaw irregularities, and benefits include an improved ability to chew, speak and breathe. In many cases, an enhanced appearance can also result. The initial healing phase will take approximately 6 weeks, but completion of the healing process will take 9 to 12 months. During the entire healing phase, it is critical that you practice the best possible oral hygiene. Your surgeon and orthodontist can assist you in this area, and may recommend the use of some special oral care devices. The orthodontist will usually begin the post-surgical phase of orthodontic treatment 4 to 8 weeks after surgery to “fine-tune” your bite. In most cases, braces are removed within 6 to 12 months following surgery.